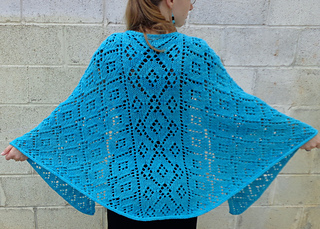 I'm excited to release Sarah's Shawl. This is a Faroese shaped top-down shawl. It comes in two gauges Aran and DK. Choose to knit it in stockinette or garter stitch, and two bind-off borders are included in the pattern. Join me at 100Creation by Rachel on Facebook for a coupon code good through July 31, 2015. Now for the pictures! The Garter Tab Tutorial was written specifically for this pattern. Welcome to Happenings, where you will learn what Rachel has been up to this week. Check back every week for Finished Items, Works-in-Progress, Reading, Watching, and Hearing. As well as tidbits from other crafters that caught her attention. This project was started last year, then brought out of hibernation and now finished. Rachel's Swirl Skirt shows even those tricky yarns can find the perfect project. It was going to be knit using MMario's Queen of Tides Shawl pattern, with fewer increases to form the skirt. Plans change, and the finished object only uses two rows from that pattern. Despite the small needle size, this simple pattern worked up fast. Get all your knitting and crochet news at one place, Knitcliks searches the web to bring you the best every Monday through Friday. Heading include, must-see K's and P's, Fashion Flash, and Knitter's in the Know. They welcome emails with submissions, whether you made it, or spotted the item. No guarantees it will be mentioned, but they are always looking for new features. Stitch Definition provides tech editing, photography. and graphic design services for many Knit and Crochet Designers. One of them was so happy with the photography she offered to do a giveaway through their blog. The Forget-Me-Not Heel is a recipe to apply to your next pair of socks. Details for the giveaway and how to get the pattern at their blog. The Revelation of Louisa May by Micheala MacColl tells the story of Louisa May Alcott solving a mystery as a teenager. Touched by history, you will learn more about this favorite author. Sense and Sensibility by Jane Austen on CraftLit is at the halfway point. You can still listen to previous episodes. For more information and links, read my CraftLit Review. Love Turtles? This cowl is part of a set included in a KAL starting September 1st. Crafts other than knitting! A finished Sewn project, and a Chain Maille necklace. This blogpost contains affliate links to Amazon.com. For more affiliate links, visit the Affiliate Links Page. The garter tab cast on gives an invisible, seamless start to shawls worked from the top down. One example is here, from my Faroese shaped shawl, Sarah's Shawl. The cast on is indistinguishable from the knitting. It also prevents the problem of a too loose or too tight cast on making your shawl look less then professional. Okay, so this cast on looks great, but how do you knit it? Start by casting on the required number of stitches. 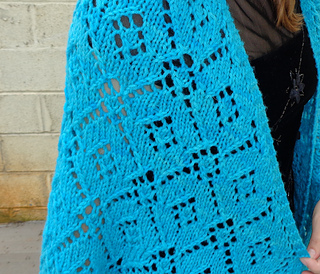 (Examples in this tutorial are for my Sarah Shawl, but feel free to use for any shawl.) In this case we will cast on 3 stitches. You can use the backwards loop cast on or a provisional cast on of your choice. This is the right side of your knitting, you will follow the pattern for the first wrong side row, and the rest of the pattern. In Sarah's Shawl, the first and last three stitches are knit on every row, making the garter tab look continuous. Thanks for joining me. Please check back for more tutorials, pattern releases, and coupons.